Are you looking for fun and unique wedding reception entertainment ideas for your special day? 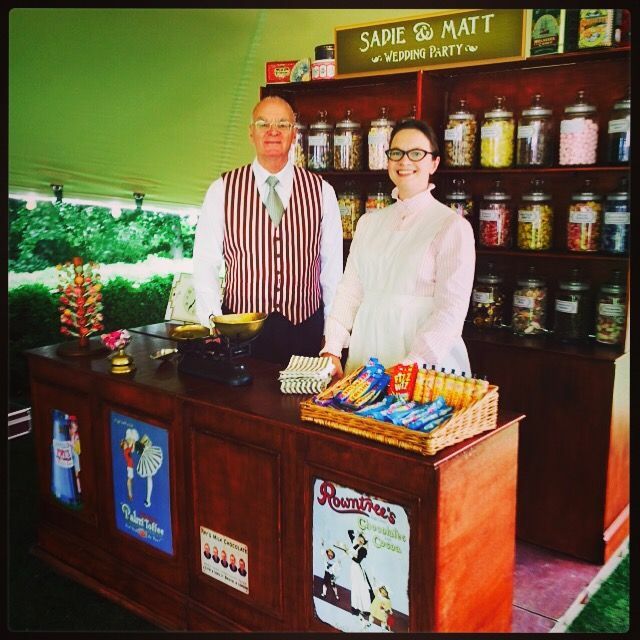 Browse this page and get in touch to discuss our mobile sweet shop hire! 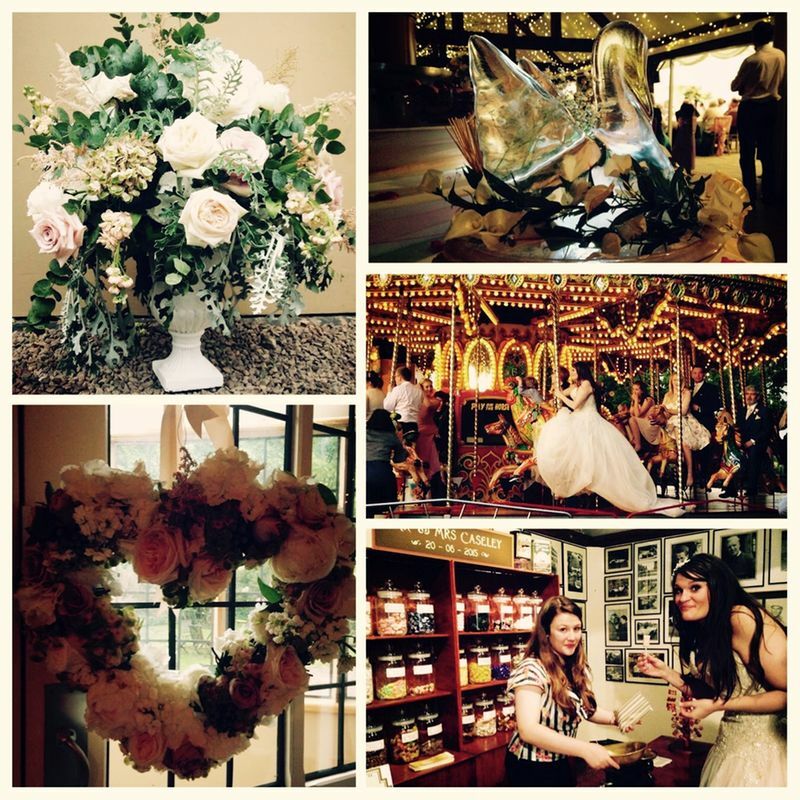 Here at Emily's Best we love all things vintage, sweets by the quarter and old fashioned service. 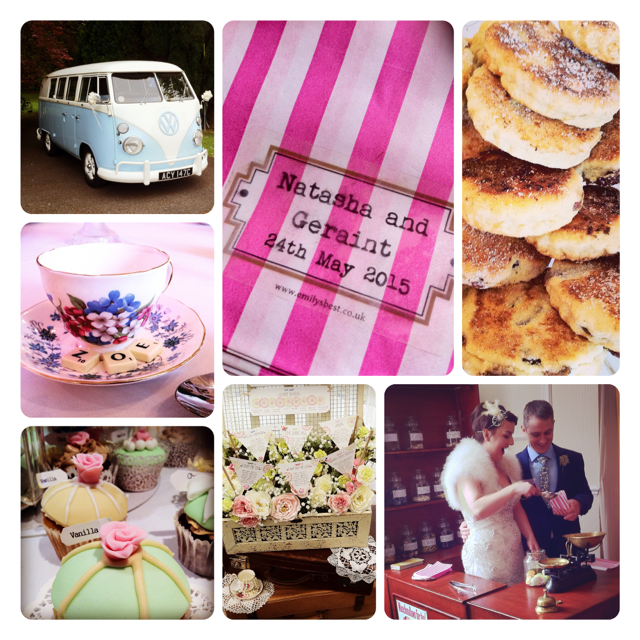 Our style is timeless and beautiful, a little bit quirky and lots of fun. 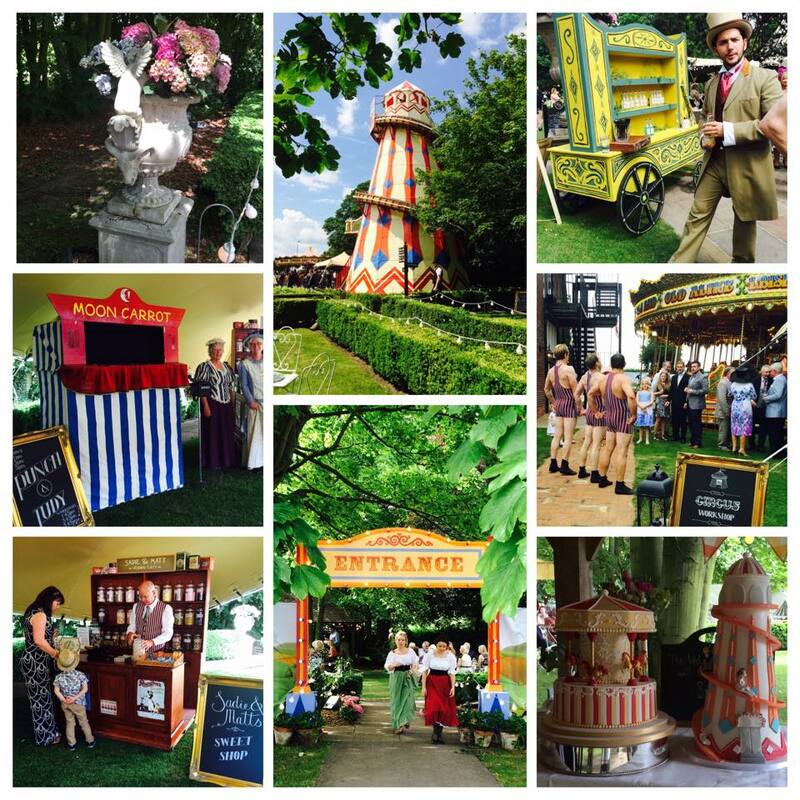 Bring something a little bit different to your wedding with our pop-up, travelling, traditional sweet shop: a magical glimpse into the past, sure to delight your friends and family. Catering for all ages and diets, with 35 varieties to choose from, there’ll be a treat for everyone! We can make your wedding truly unique with our Golden Ticket place setting cards, candy favours and personalised signs, bags, and even sweets! So why not give yourselves and your guests a treat that will make your wedding day extra special? 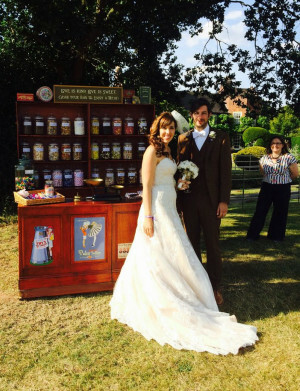 We're far more than a sweet cart or candy buffet: with our staff in vintage uniform our unique sweet stall adds the authentic feel to your wedding sweet shop experience. 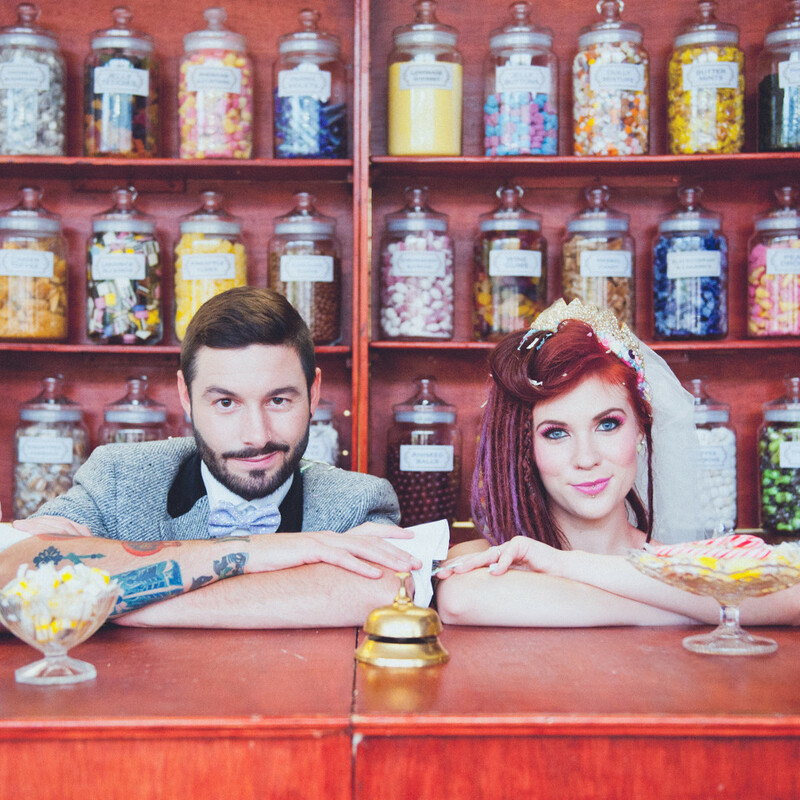 The Emporium package includes the shop fully stocked with a range of 30 traditional sweets in glass jars, plus 5 counter-top treats and 3 hours unlimited service to your guests, served by two of us at Emily's Best. 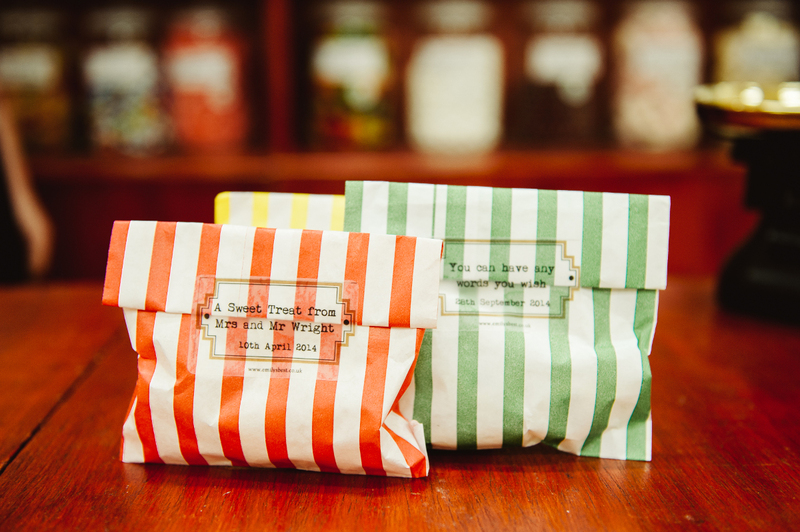 We source our sweets from family-run British confectioners to add the real taste of yesteryear. If you have any particular favourites, you can pick 2 of the 30 weigh-out sweets. Anything your hearts desire, as long as it's still in manufacture! Each guest will be served two ounces (57 grams) of their choice of sweets per visit in stripey paper bags selected to complement your colour scheme. Guests can return to the shop as many times as they like. Our sweet selection is extensive so there should be something for everyone and we can cater for most special diets on request, for example vegetarian, vegan, halal, gluten-free and sugar-free varieties. 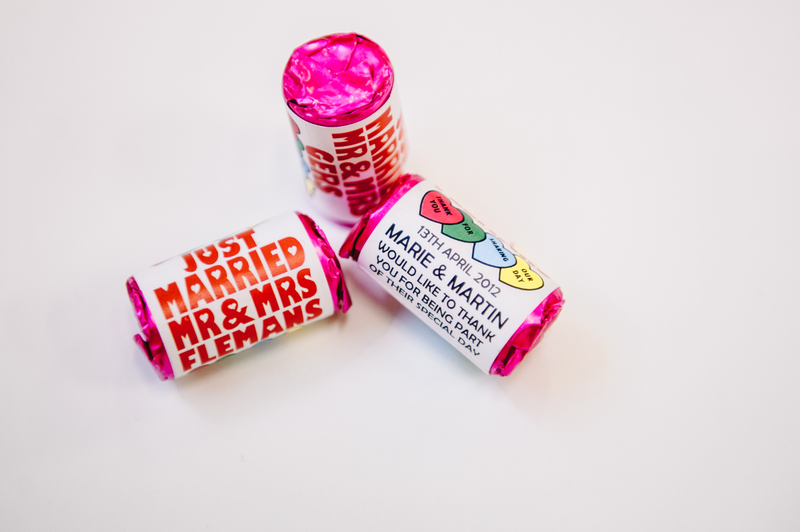 We also have Golden Tickets which can be used as your wedding favours, inviting your guests to visit the unlimited sweet shop of their dreams. If you would like them, these are sent out in advance so you can use them on your place settings, and are included in the price. The Petite Sweets package is designed for those who have a smaller area available for us to set up in, or whose budget is more petite. The sweet shop looks just like the Emporium one except it is half the width and requires 1 member of staff to set up and run instead of 2. It has 15 jars each holding approximately a kilo of sweets, which makes it ideal for weddings with up to about 120 guests. The service period is a little shorter at 2 hours instead of 3, and we make all the sweet selections for you - whilst ensuring that there is a bit of something for every taste. The price for this package is correspondingly petite at £250 no matter how many guests you have. 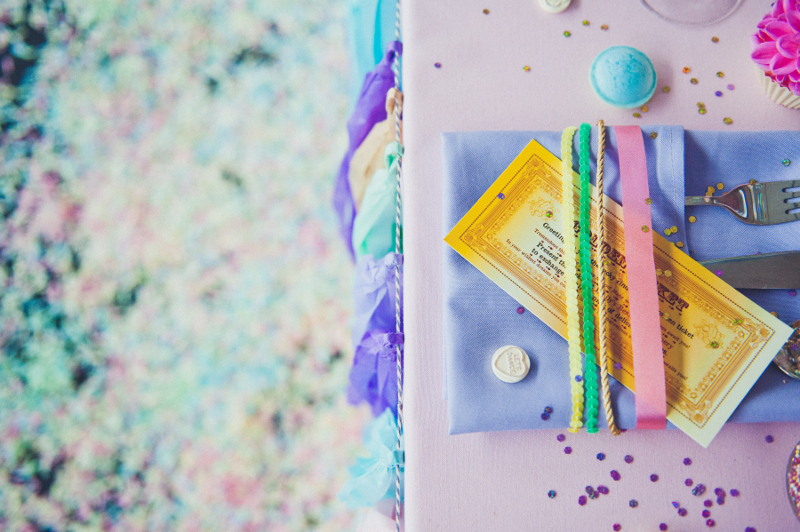 Why not add that "Willy Wonka" effect to your wedding with Emily's Best Traditional Sweet Shop Golden Tickets as your favours? 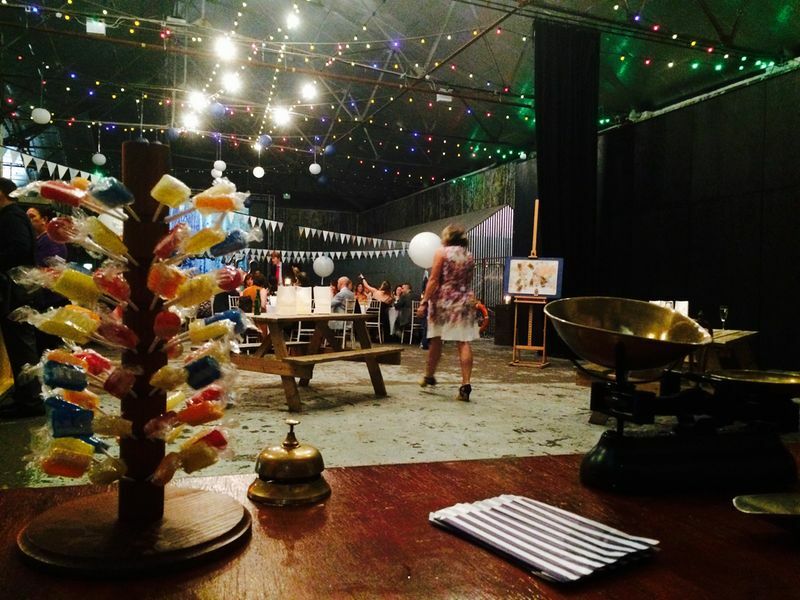 Each guest receives a Golden Ticket inviting them to visit the unlimited sweet shop of their dreams. If you would like them, these are sent out in advance so you can use them on your place settings, and are included in the price of our Petite and Emporium packages. 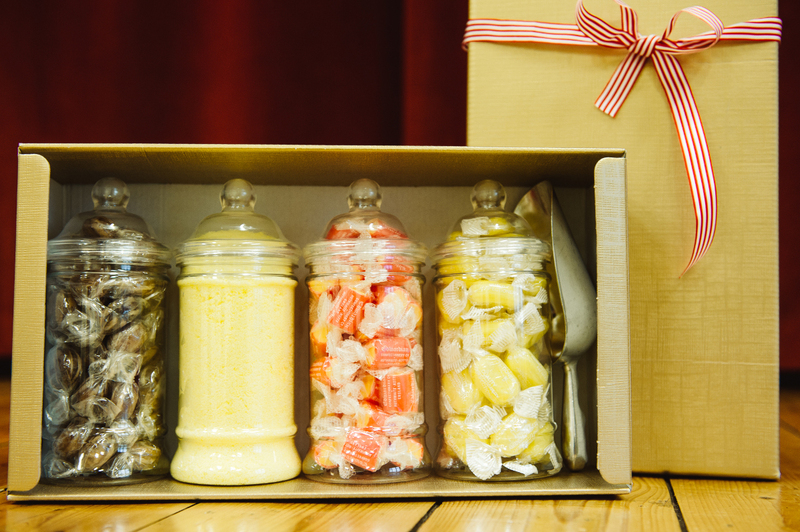 Our Sweet Hampers are the perfect thank you gift your wedding helpers and are available to purchage with your choice of sweets. 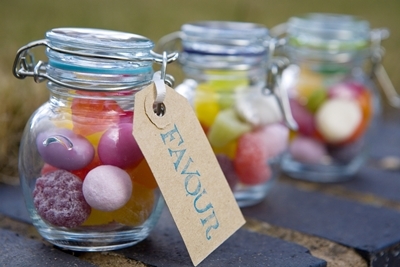 We also offer Sweet Jar Wedding Favours that are available to purchase for £2.50 per jar plus P&P. 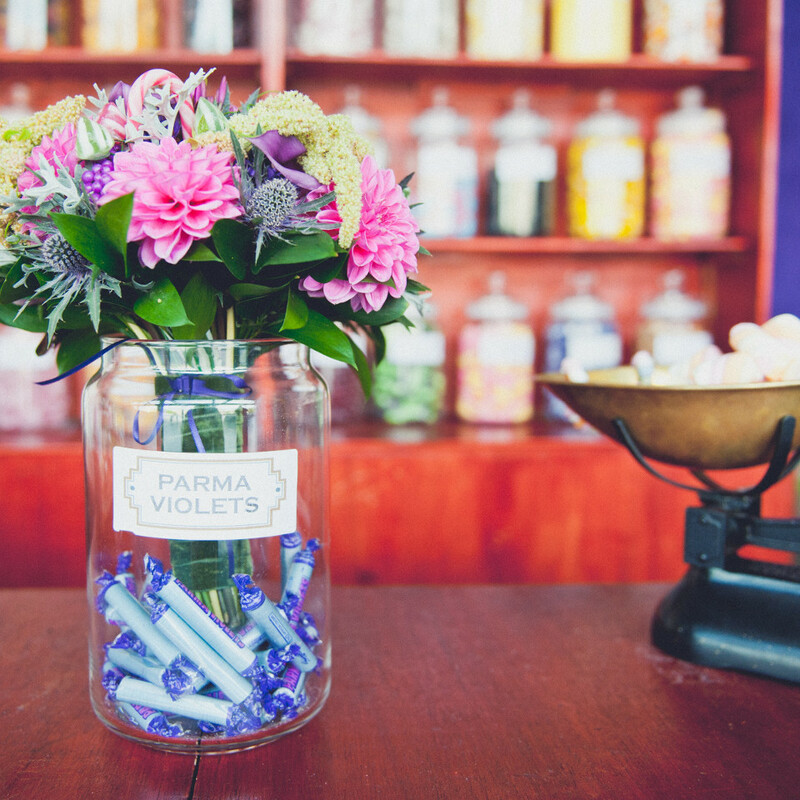 Why not add that extra touch to your sweet shop by personalising it for your wedding? Your bags can display your own message or names and wedding date; the top sign can incorporate your massage or names - which we give you as a gift after delighting your guests; and you can select personalised sweets to add to the sweetie selection (choose from Love Hearts, mint chocolates or Mr & Mrs / Just Married rock sweets). 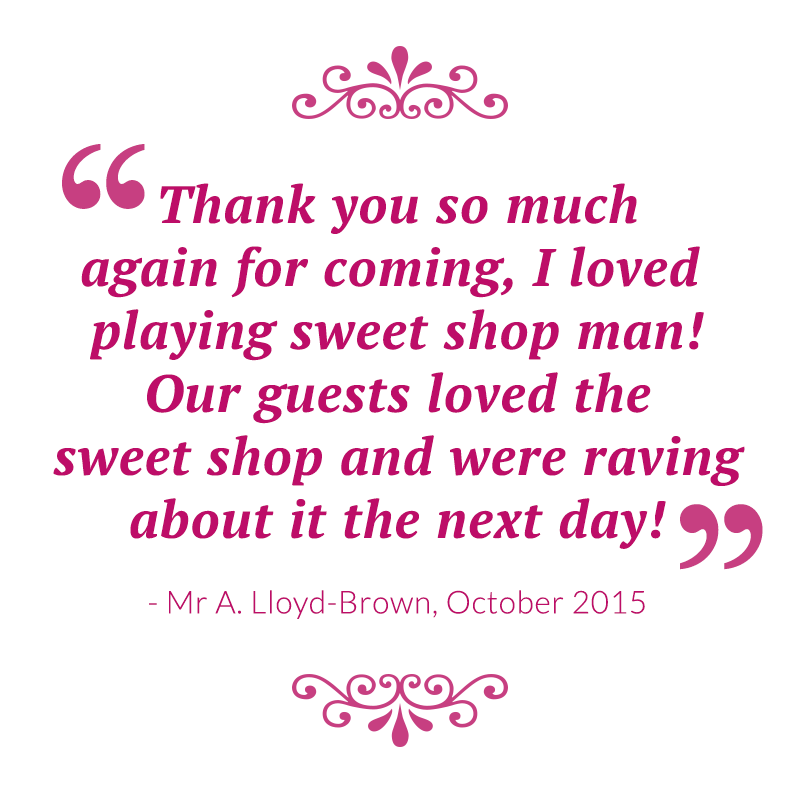 We'll discuss your day and plan your personalised traditional wedding sweet shop with you. We are often asked "when it is best for the sweets to be served"? Sweets are, of course, perfect at any time of day, but in our experience there are two points within a wedding day that work best. 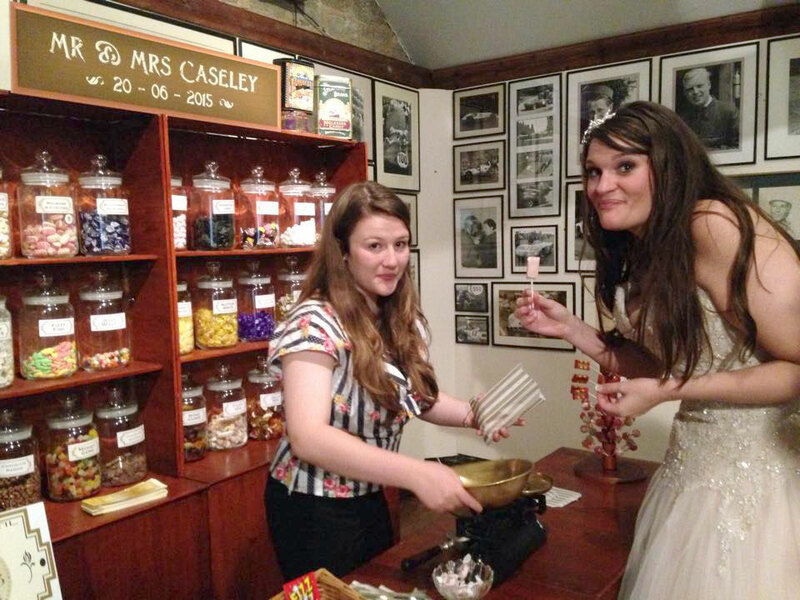 Firstly, a magically appearing sweet shop is perfect right after your ceremony as your guests mingle. It provides a little something to keep people going whilst your beautiful photographs are being taken, and why not take some fabulous photos in the sweet shop too? What an unusual wedding picture! Our most popular time slot is in the evening - after the wedding breakfast and whilst your guests arrive. This means that all your guests get to experience the fun. There's nothing more welcoming than a childhood memory of your favourite sweeties to wow your guests and give them the energy to dance the night away. Sweets are weighed out from big glass jars, wrapped in stripey paper bags and with 35 varieties to choose from there will be something for everyone. Your sweet shop can be supplied fully stocked with exclusively vegetarian, vegan or halal approved varieties of sweets on request. Many other special diets can be catered for too - just let us know! 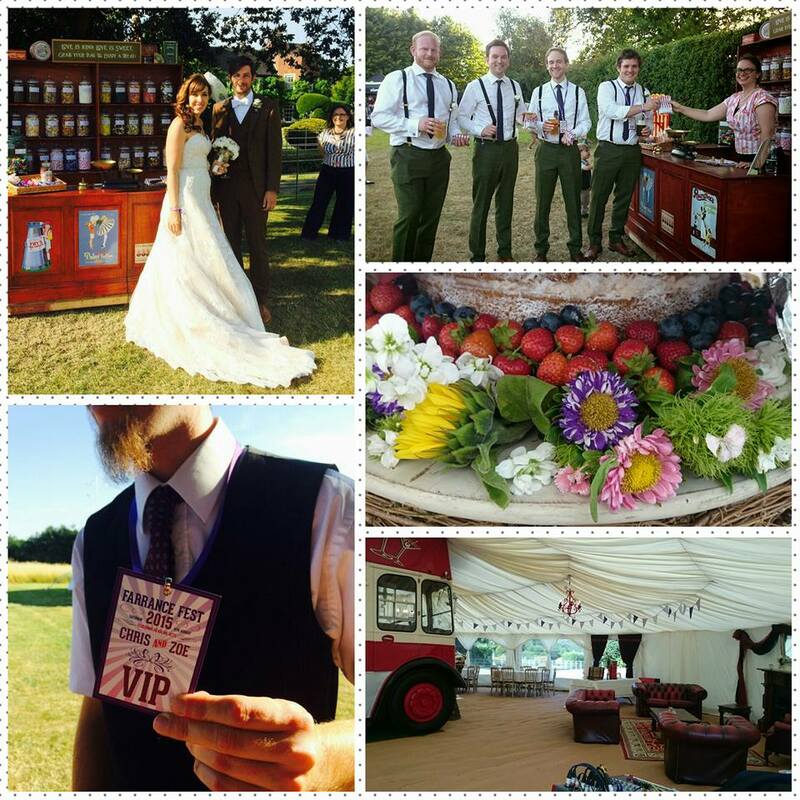 Emily's Best Sweet Shop has proved a big hit at Asian functions, as not only do we offer fully approved vegetarian or halal Asian wedding entertainment, we can cater for anything up to 1,000 guests and provide two stands if required. For full details of our prices, packages and terms and conditions, please contact us and we'll send you everything you need to know or you can download our handy prices PDF from the link below. We can offer more ideas and welcome questions and requests that will help make your day unique, so don't hesitate to contact us. No electrics are needed for either of our Traditional Sweet Shops. We simply require a flat space either 6ft wide by 5ft deep for our Emporium shop or 3ft wide by 5ft deep for our Petite shop. We are fully insured with £10 million public liability insurance are are food hygiene certified and qualified.